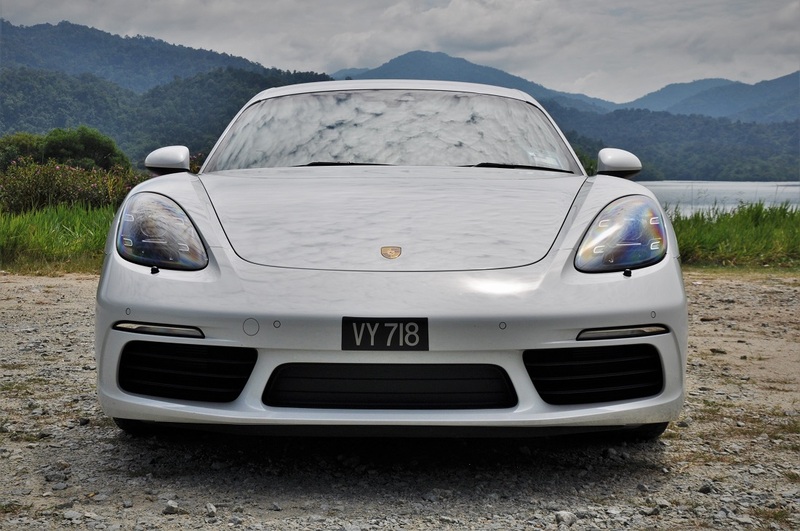 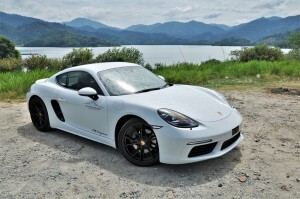 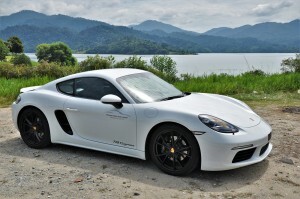 The Cayman is the hardtop version of the Boxster and the baby in Porsche’s line-up. 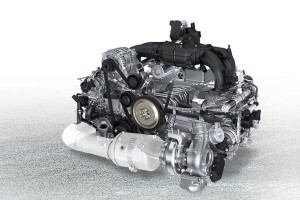 Like the Boxster, it has a rear mid-engine configuration i.e. the engine sits between the front seats and rear axle, effectively cutting out any chance of a +2 seating (or what I like to call ‘space for groceries’). 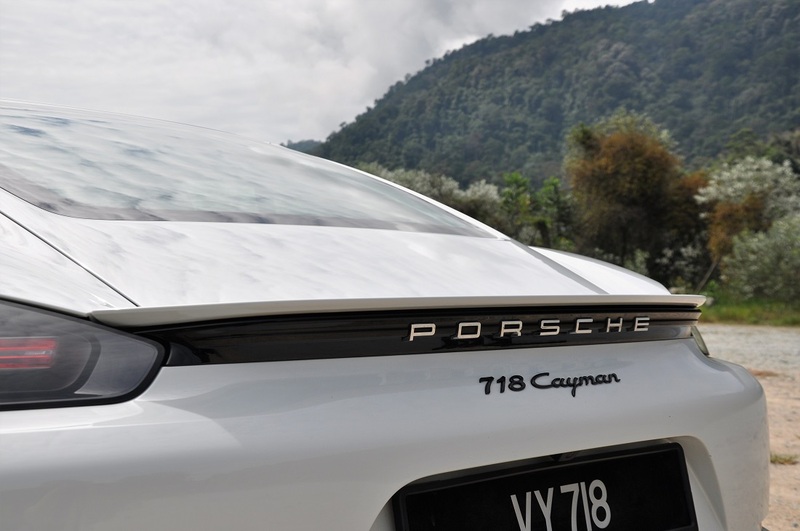 The 718 Cayman is the latest iteration, with the ‘718’ evoking romantic sentiments of Porsche’s historic 718 race cars which were so successful in the 1950’s and 60’s in such classic races as the Targa Florio and Le Mans. 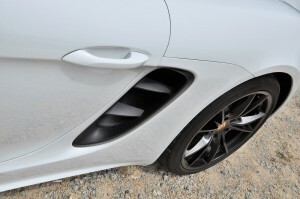 The 718 Cayman is reworked with taut proportions hosting larger front and side air intakes. 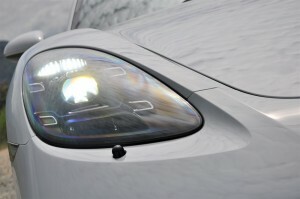 The nose now has a sharper profile to its predecessor which makes the front look wider and more athletic. 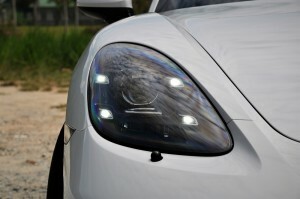 The sharper front also houses slimmer headlights. 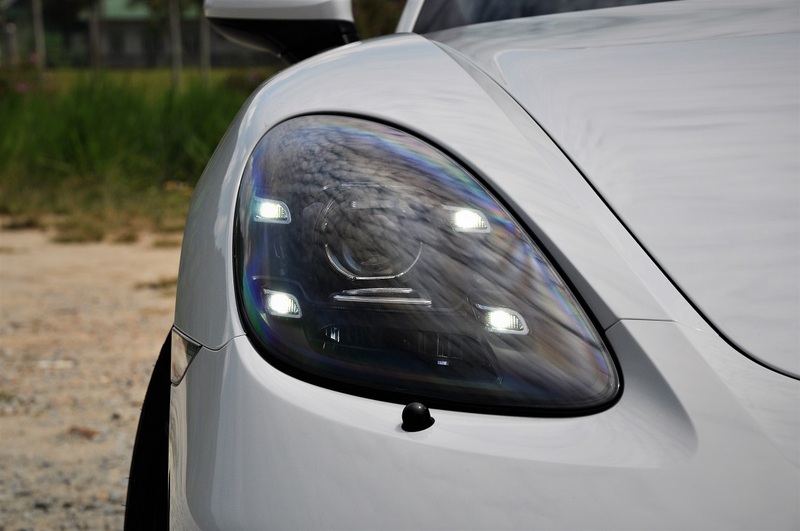 The LED headlights with 4-point daytime running lights (which includes the Porsche Dynamic Light System) featured in this review car is an option that shouldn’t be missed as it just enhances the car’s sporty appearance. 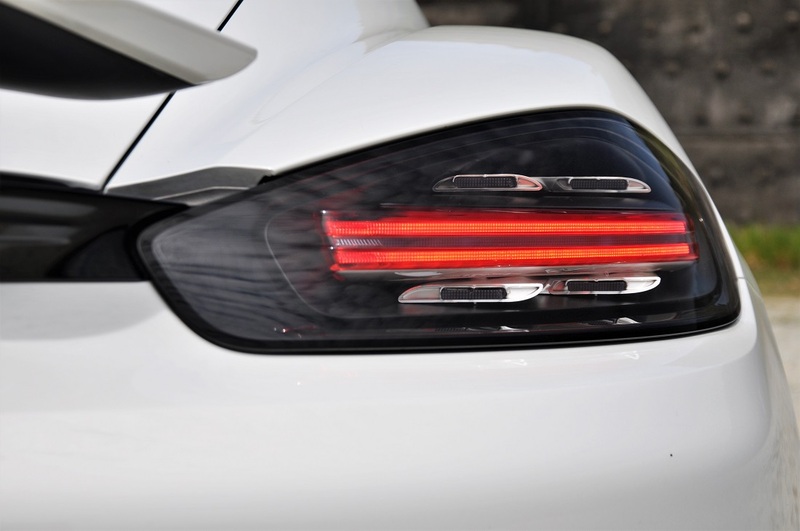 The rear of the car is also redesigned to have a wider, more stable stance, with an accent strip that not only joins the redesigned 3D tail lights with 4 brake spot lights, but also hides the retractable rear spoiler. 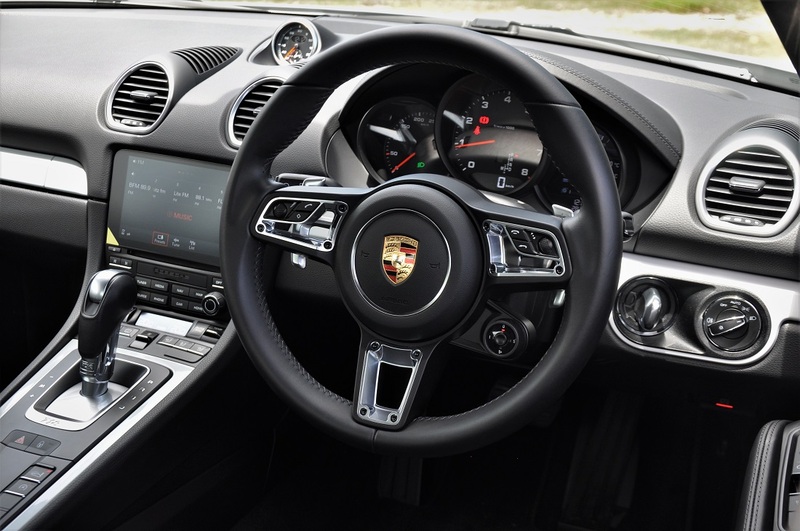 In the cabin, the main changes are on the top half of the dashboard which now has more circular air vents and the Sport Chrono clock/timer placed further forward; the Sport Chrono pack is also an option not to be missed. 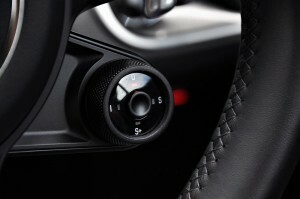 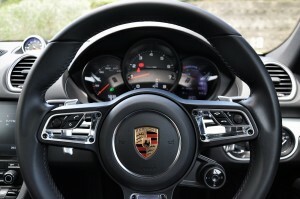 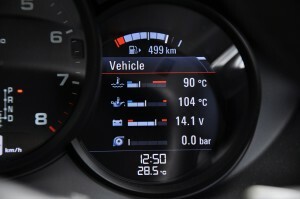 Besides that, the steering wheel is updated to the 918 Spyder design with the drive mode toggle. The 718 Cayman comes standard with the Porsche Communication Management and dual zone climate control. 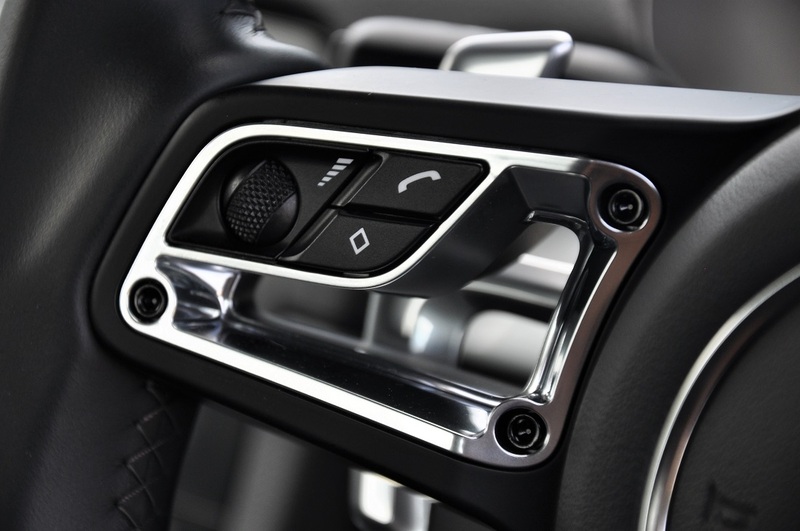 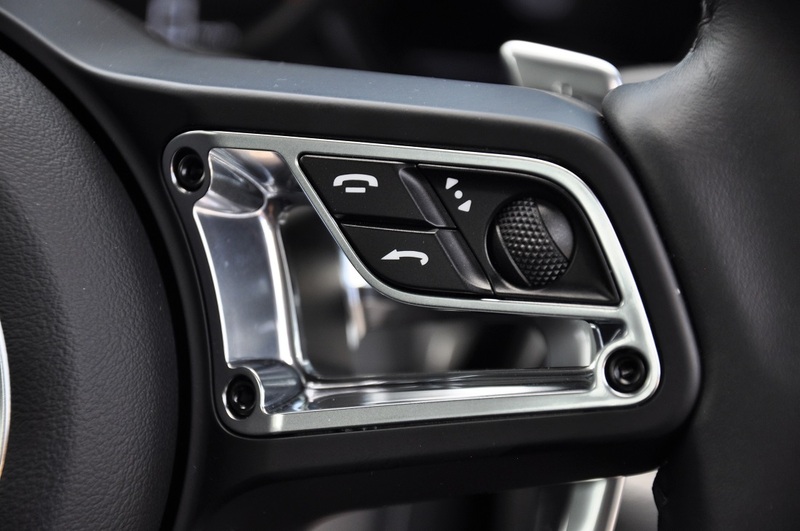 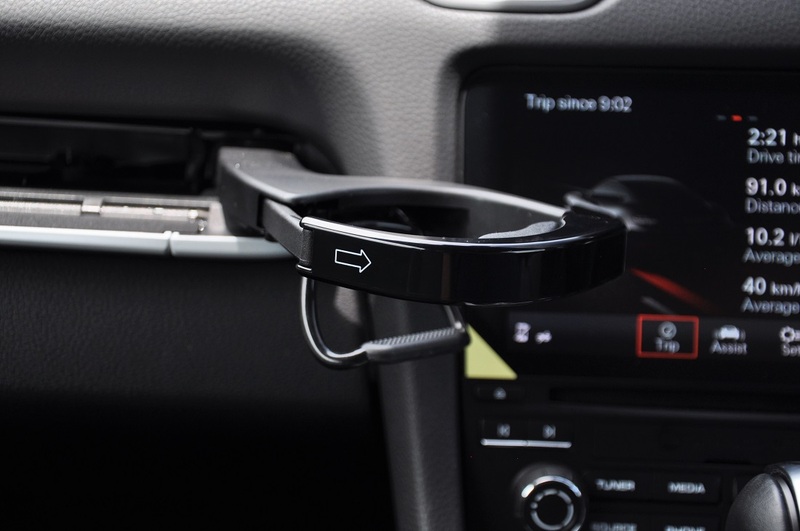 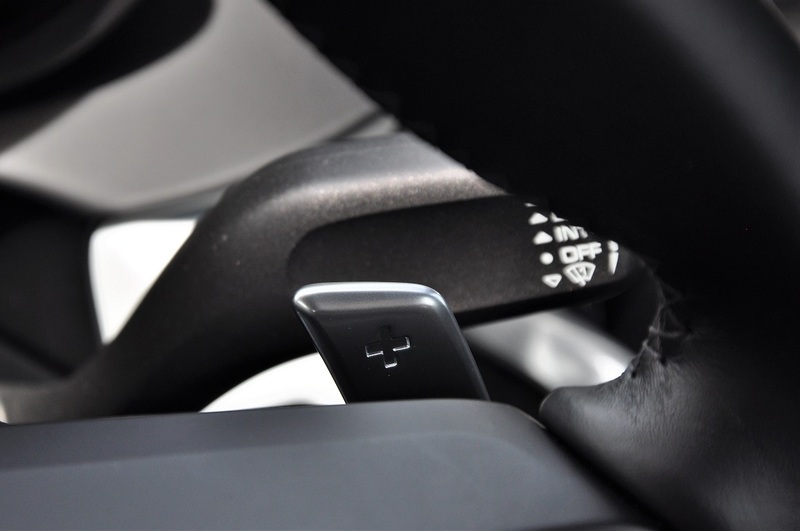 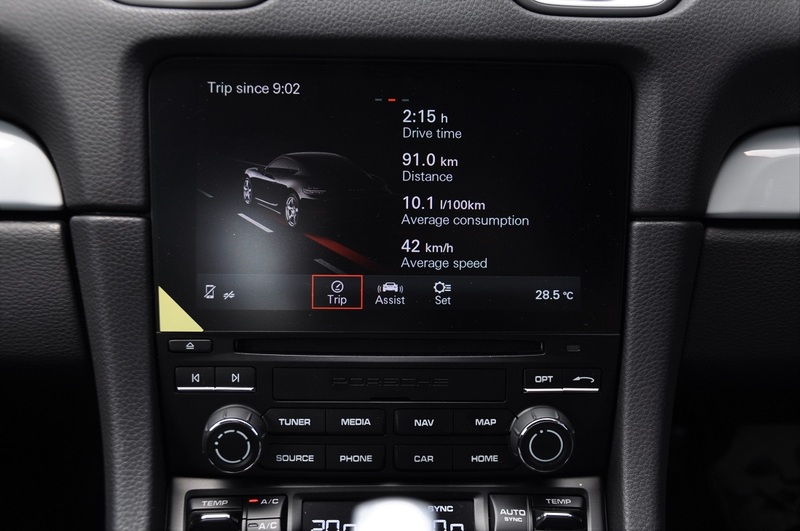 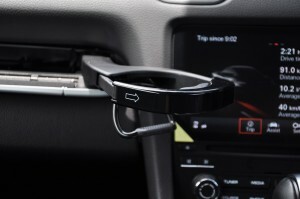 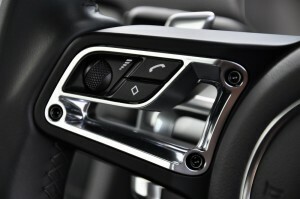 Connectivity comes in the form of the Connect module which includes USB port and Apple CarPlay. 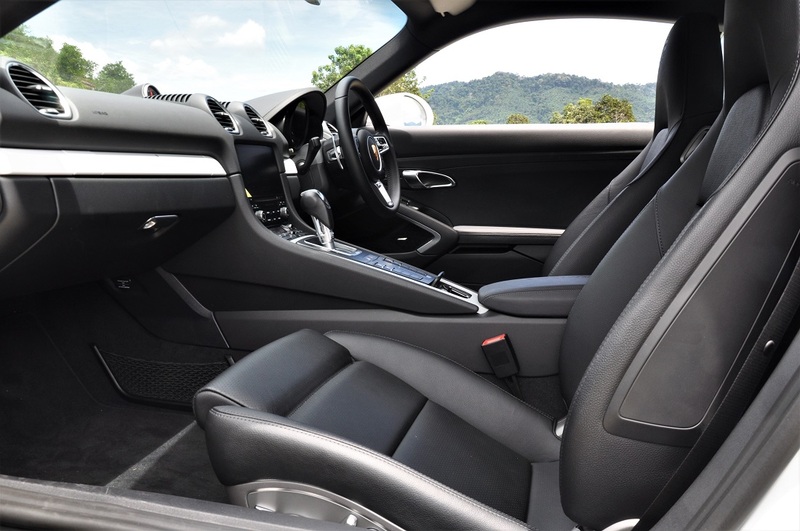 There are only 2 seats in the 718 Cayman and they are comfortable and supportive as expected. 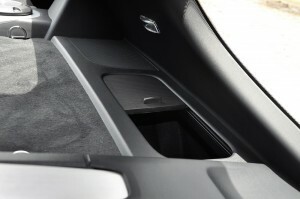 Like its predecessors, the cup holders are hidden in the accent strip above the glove compartment; great for the passenger but a bit of a stretch for the driver. 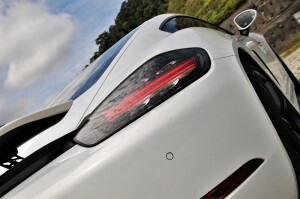 In terms of storage, the 718 Cayman can hold about 405 liters but this is split between 2 compartments on either end. 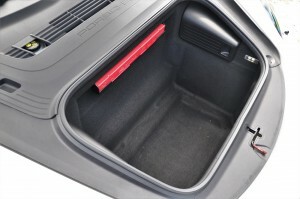 The front holds about 130 liters while the rear, 275 liters; enough for a bit of shopping or a weekend getaway, but not for furniture shopping. 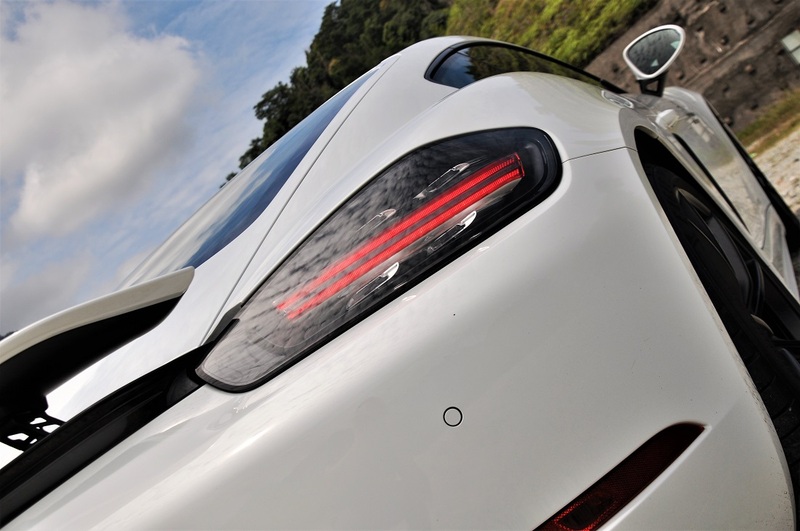 As the base model, the 718 Cayman is powered by a 2L turbocharged flat-four engine, a reduction in capacity and pistons from the previous 2.7L flat-six. However, turbocharging has helped to significantly increase power to 300 hp (+25 hp) and 380 Nm (+90 Nm); the smaller engine also means weight savings (and to us, road tax savings too) which means there’s more hp in a lighter car. 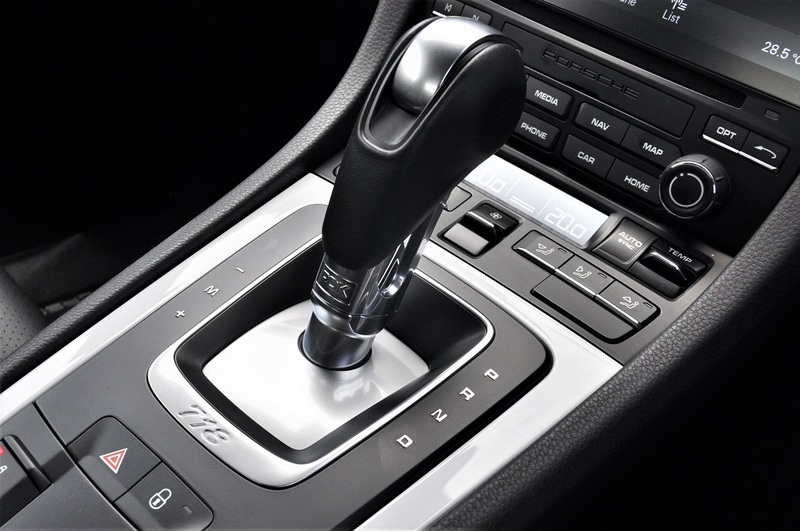 This power is managed to the rear wheels by the 7-speed dual clutch PDK transmission. 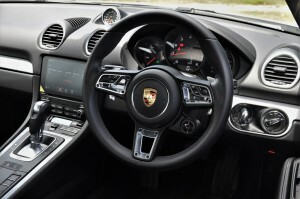 The earlier mentioned Sport Chrono package adds Porsche Torque Vectoring and a limited slip differential to help control this power. 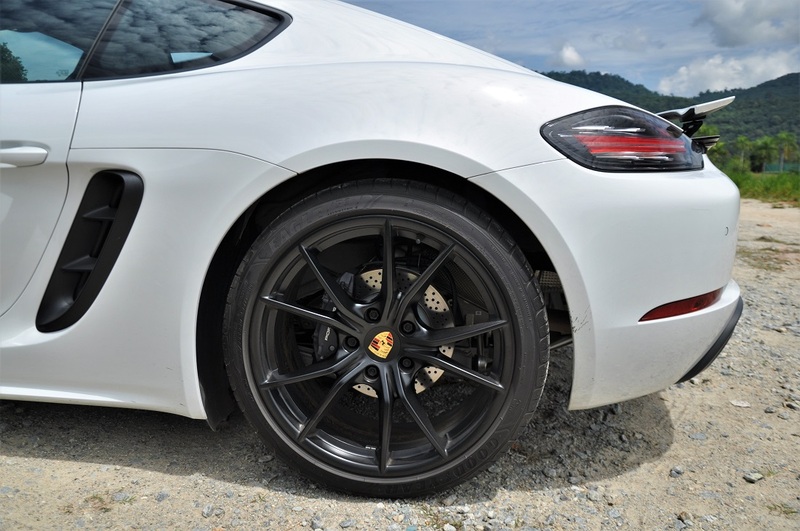 With PDK and Sport Chrono, the Cayman’s 0 – 100 km/h time is 4.7 seconds. 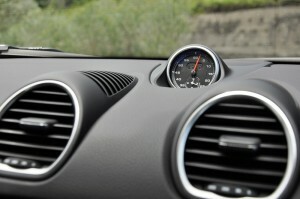 Speed is capped at 275 km/h. 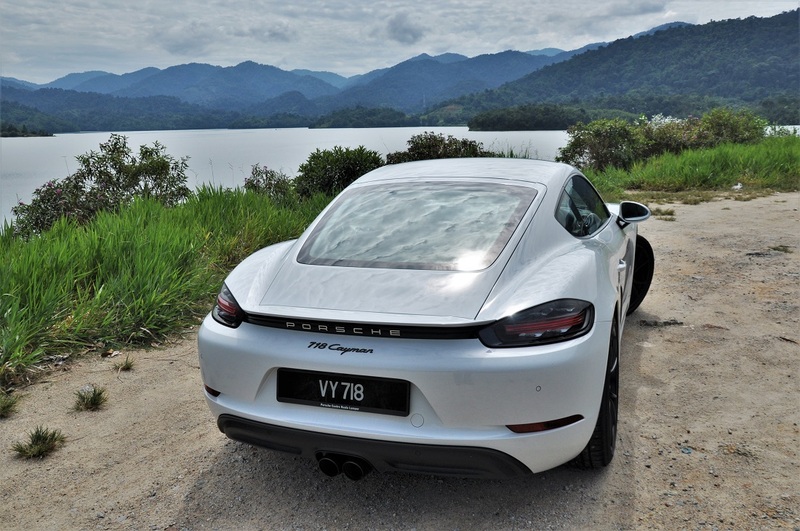 Besides taking the 718 Cayman out on the road, I also had a go with the car on the Sepang track, together with its more powerful Porsche siblings. 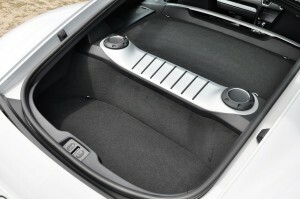 This is where you feel the Cayman plays in the minor league. It is still nonetheless a great car to drive, if you ignore the power deficiency it has to the bigger Porsches. The mid-engine layout kept most of the weight between the axles allowing for better cornering stability. 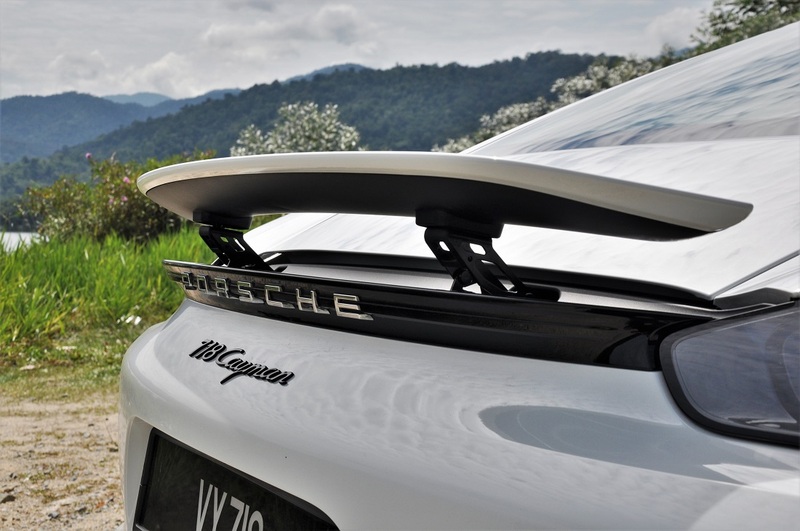 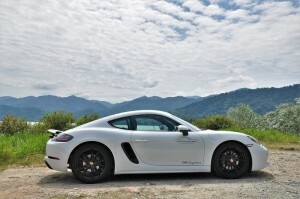 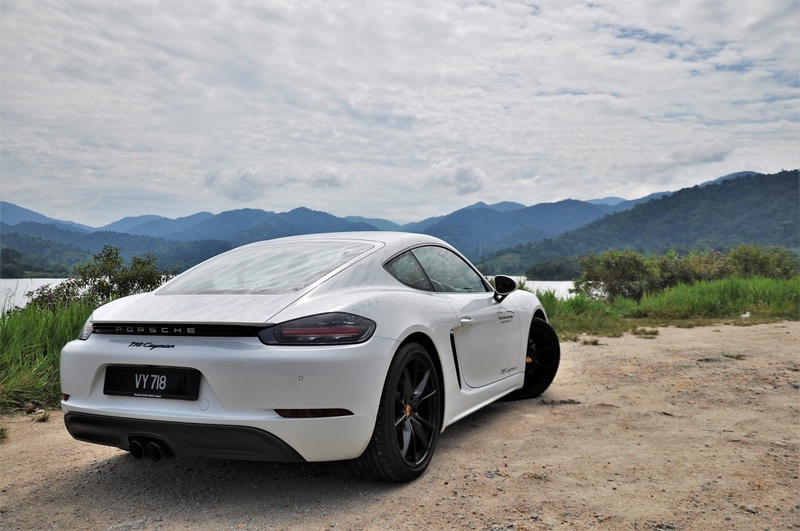 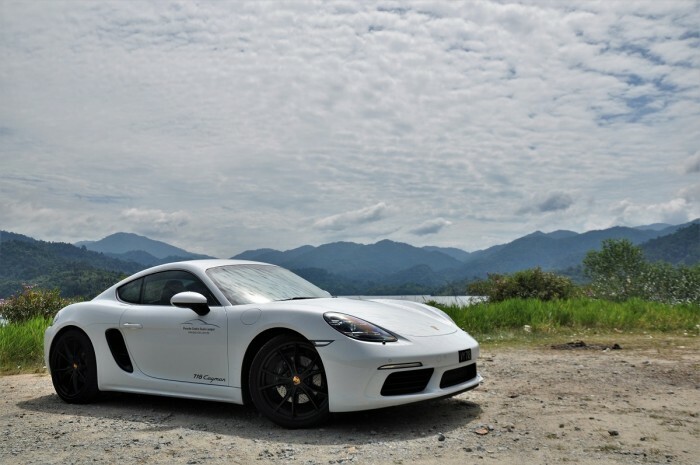 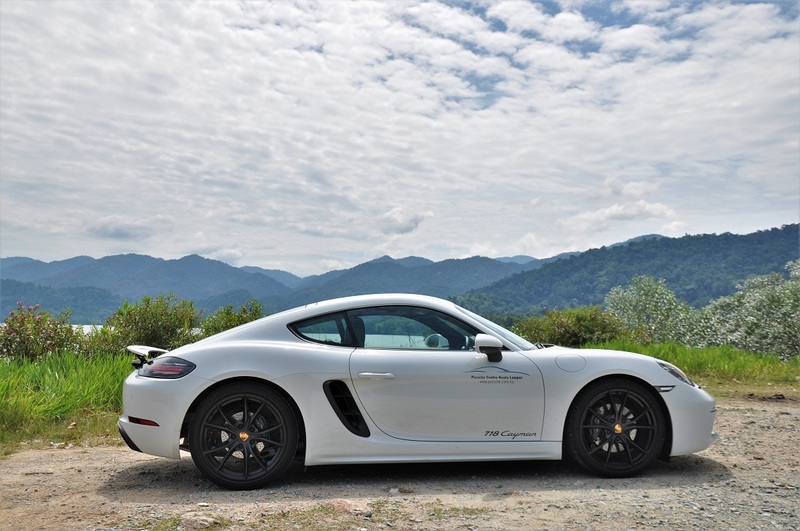 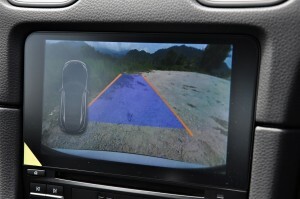 It is a feature I’m comfortable with, and together with the Porsche Active Suspension Management (which lowers the car by 10 mm) and the other driving aids available, allowed me to have a fun time with some white-knuckled driving on a lonely windy road. 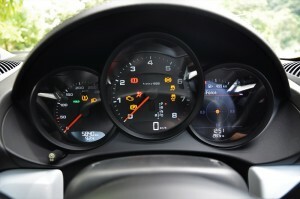 The balance was so appreciated that I drove faster than expected, and than I should have. 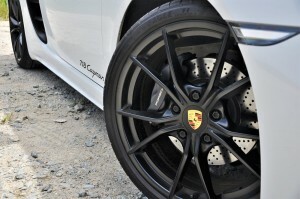 The optional 20″ Carrera S wheels (painted in satin black) contributed to the improved handling too. 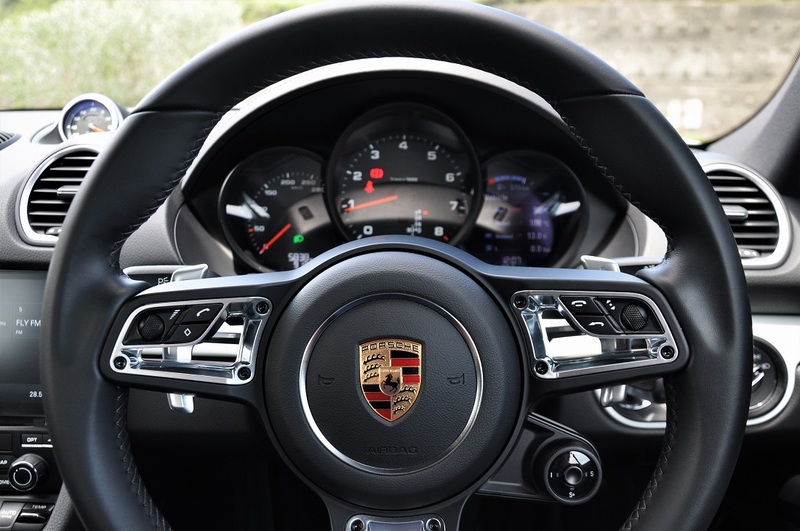 Shifting the gears was a breeze with the aid of the paddle shifters but in most driving scenarios, the PDK sorts out power delivery well enough, even in Normal mode (there’s also the choice of Sport, Sport+ and Individual modes). 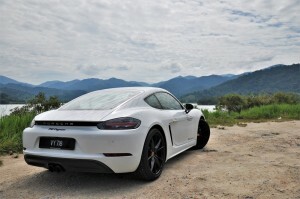 The beauty of the 718 Cayman is that it isn’t just defined as a weekend ride or secondary car. 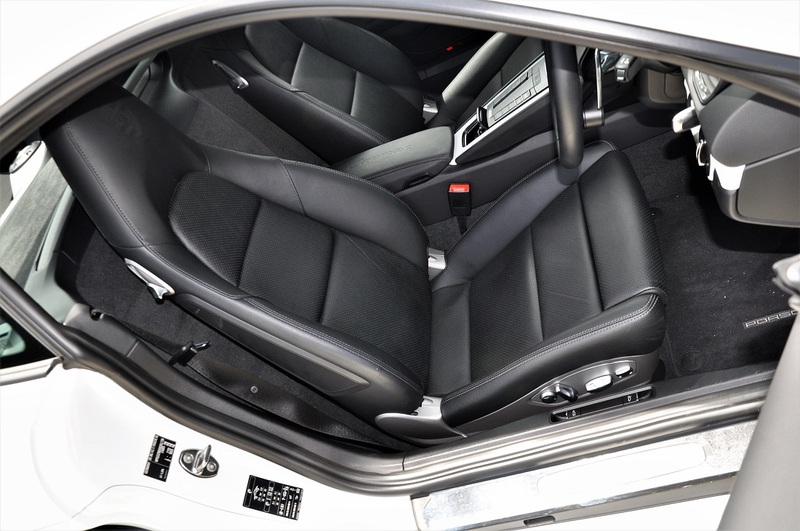 If there’s no need for more than 1 passenger, this car can serve well as a daily commuter; it easily clears but the most extreme of speed bumps and basement car park landings. 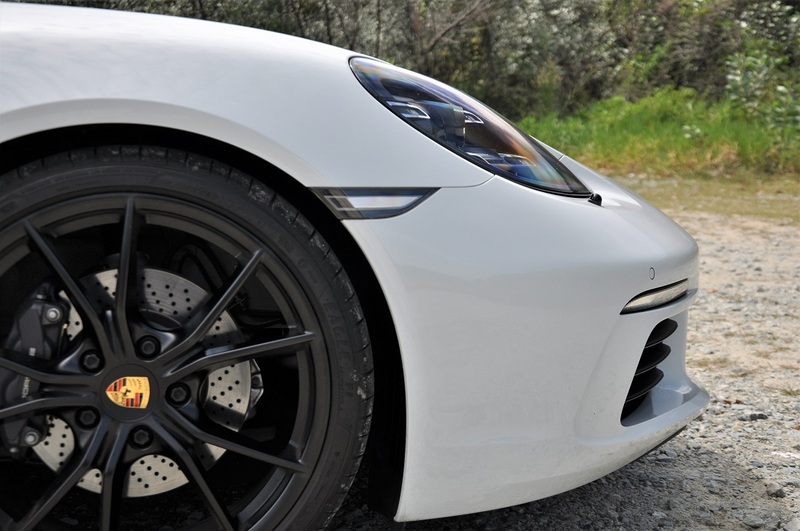 And if you’re not going all-out on the track, you’ll rarely need all its 300 horses. 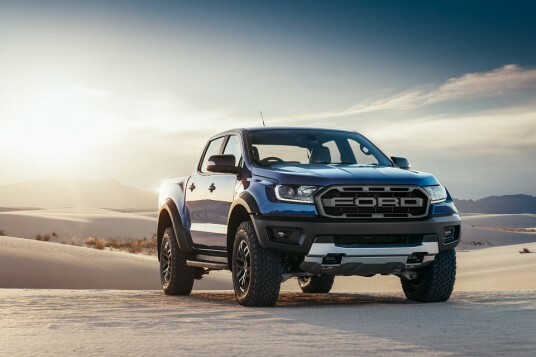 Furthermore, the car comes with a 64 liter fuel tank and even if you’re not being too careful, you can still easily net an average consumption of around 11 liters per 100 km. The Porsche 718 Cayman tested is equipped with (but not limited to) automatic dimming mirrors with rain sensors, ParkAssist (front & rear; including reverse camera), Porsche Entry & Drive, sports tailpipes in black, fully electric 14-way adjustable Sports seats, BOSE surround sound system, and costs RM 617k. 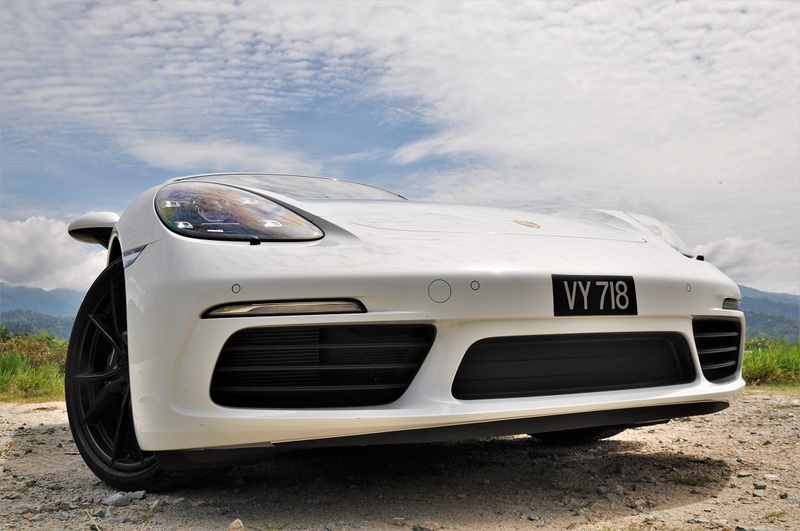 It is covered by a 4-year warranty and a 4-year or 100,000 km free service and maintenance package.